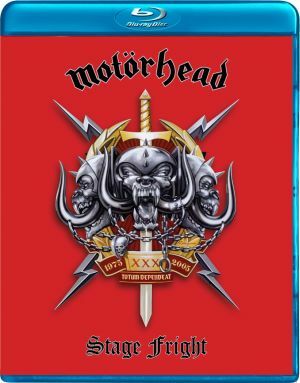 MOTORHEAD - STAGE FRIGHT (BLURAY) | Online Shop | Wizard LTD.
Lemmy Kilmister explains his unabatedly passionate relationship with his own band and its varied history as follows: “Motörhead is not only my job, it’s my whole life.” The legendary group is about to celebrate its 30th anniversary this year, looking back on a unique career. Motörhead have sparkled on the world’s most prestigious stages, graced countless important music magazine covers and released numerous rock classics. The fact that this band counts among the most authentic and charismatic rock acts world-wide is without a doubt due to the never-tiring enthusiasm of Lemmy, who continues to live his own visions of musical earthiness irrespective of trends and fashions. His latest release, entitled Stage Fright, is not merely a rock’n’roll statement chiselled into stone, but also an extraordinary look at the band’s life. Stage Fright was recorded during a show at the Phillipshalle in Düsseldorf on December 7, 2004. The set features 20 songs from the entire Motörhead history, including ‘Overkill’, ‘Ace Of Spades’ and ‘Iron Fist’. This memorable occasion was shot with 23 high definition cameras under the direction of Sven Offen (Papa Roach, Heather Nova, Grönemeyer, Toten Hosen, among others). Gert Hof, famous not only for his work with Rammstein, was enlisted to take care of the show’s light design.